Hillsboro senior Ethan Watson finishes the fast break with a layup on Tuesday at Hillsboro High School where the Indians hosted the Adena Warriors in a non-conference boys varsity basketball matchup. 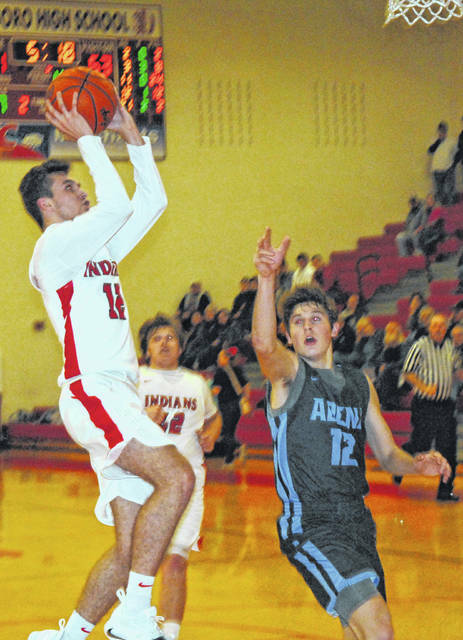 The Hillsboro Indians hosted the Adena Warriors on Tuesday in a non-conference tilt that resulted in the Warriors emerging victorious by a final score of 69-61. The Indians honored seniors Ethan Watson, Mason Swayne, Reece Bloomfield and Jarrod Thompson between the junior varsity and varsity contests. Hillsboro Head Coach Bruce Miles talked about the four seniors on the team and thanked them for their hard work over the course of their high school careers. The Indians got off to a hot start in the first quarter after falling behind 3-0 Hillsboro’s Ryan Scott hit back to back three pointers from the wing to put the Indians up 6-3 early in the game. After four quick points gave the Warriors a 7-6 lead with 3:52 to play the teams traded buckets and the lead until Logan Bennett converted a layup with 2:18 to play in the first that was the last points of the quarter and gave Adena a 11-10 lead heading into the second period. Bennett had the first bucket of the second quarter for the Warriors and pushed their lead to three points before Watson sank a three pointer for the Indians to tie the game at 13 with 6:55 to go in the second quarter. The teams traded baskets and Adena took a four point lead at 18-14 before Scott and Swayne connected on back to back three pointers that gave Hillsboro a two point lead at 20-18. Adena tied it up with a basket of their own to make it 20-20 with 2:56 to play until halftime but Indian seniors Watson and Swayne hooked up for an alley-oop layup that saw Swayne cut backdoor and elevate for the pass from Watson on the perimeter. Adena rattled off five quick points to take a 25-22 lead before Scott drilled his fourth three pointer of the half with 1:16 to play in the second quarter and tied the game at 25 apiece. Bennett recorded the final three points of the half with the first two coming on an alley-oop of his own and he split a pair of free throws with 25 seconds to play to put the Warriors up 28-25 at halftime. The Warriors opened the third quarter with a 14-6 run as Bennett converted two triples and scored 10 points for Adena to put the visitors in control at 43-31. Watson answered for the Indians with six consecutive points as he tried to keep the Indians within striking ditance. Watson also hit two free throws in the frame with 1:07 left to cut the lead to five points but, the Warriors added another basket before the buzzer sounded and took a seven point 46-39 lead into the fourth quarter. Hillsboro was able to cut the lead to four points on a three pointer by Watson that capped a 10-2 run as the scoreboard read 55-51. However that was as close as the Indians would get for the remainder of the game as Adena was able to secure the win at the free throw line down the stretch. Hillsboro will be back in action on Saturday, February 9, when they travel to McClain High School to take on the Tigers in a cross-county and Frontier Athletic Conference rivalry game.